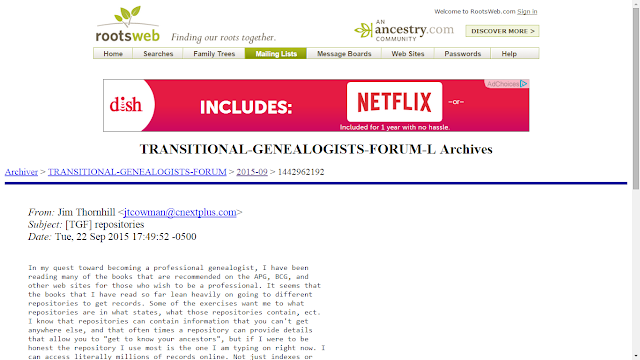 There has been an interesting discussion on the Transitional Genealogists Forum (TGF) mailing list over the last two days - sparked by this post by Jim Thornhill on "Repositories." "My question is, ... am I depending too much on the internet?" 1) Ann Gillespie noted: "I've seen estimates that 5-10% of the existing documents are online. Since I spend a lot of time in DC at NARA and the Library of Congress, I have no trouble at all believing those estimates." 2) Karen Packard Rhodes added: "Having used the Florida State Archives, Library of Congress and the General Archive of the Indies in Seville, Spain, I can second every word in favor of archives. And, yes, only a tiny bit so far of documents are available online." 3) Harold Henderson said: "I don't know how to verify percentage claims, and some older references may emphasize physical repositories more than they would if written now, but there is essential material both places. Let's run down the list of ten "commonly used sources." In each case, other folks on this list may correct or add my top-of-the-head take on them." 4) Patricia Hobbs offered: "When you have done a lot of research in repositories such as courthouses, you realize just how little is online. I would recommend taking some of your families ... and going to at least a couple of courthouses and see for yourself." 5) Elissa Scalise Powell noted: "if you want to grow your business past the generalist stage you will need to solve tough problems for which all the 'low hanging fruit' has already been plucked from the Internet. You will have to know the resources in repositories around you so that your clients will be paying for your expertise and locality - not your ability to type into a search engine. As you transition into a specialist you will learn more and more about how the repositories can serve you." Elissa offered a lot more - read it all! 6) Phyllis Garratt commented: "Only a tiny fraction of a percentage of records and photos and manuscripts are online and they can be a goldmine of very personal and brick-wall-breaking information. I've found files full of letters written to the US from family back in Germany, never before seen photos of ancestors from the 1800's, and scrapbooks full of ephemera related to the life of the person I'm researching. And these are not famous people. There is a treasure trove of information out there just waiting to be discovered but you have to go there to find it." 7) Melissa Barker noted: "I am the archivist for the Houston County, Tennessee Archives. I can tell you that we have 3 rooms full of original records and only 5% of them have been microfilmed and I would estimate only 1% of them are online in index form or image form. That leaves a lot of our records only located in our archives. We are a small county in Tennessee and so we don't have as many records as other counties but I also know that there are much larger counties here in Tennessee that have the same percentages of available records online. We even have counties that don't even have an archives and their records are just sitting in storage an no one is doing anything with them." 8) Sheila Benedict offered: "I can check for vital records, order some online but not all. I cannot get most legal files online and that is fine. Getting out of the office and going to a repository is not only a vital part of what I do, it is also invigorating and reasserts why I love this business. When I need some documents I cannot travel to get, that is when I ask colleagues in other areas of the country or places overseas to retrieve the document(s) for me. " 9) Claudia Breland summarized: "In my work as a professional genealogist, I am very often requesting research from other genealogists across the country to get records that are not online." 10) Judy noted: "I will only emphasize that exploration of repositories can turn up quite unexpected and useful items that can help distinguish families and same-named persons." As you can see, Jim received lots of excellent advice from excellent researchers and archivists. Please read the entire thread of responses to get the full benefit of the answers offered - all are on point and meant to be helpful. This mailing list is one of the very best places to ask a question about almost anything genealogically related - resources, methodology, business practices, etc. An honest question will get honest and factual answers from a number of experienced professionals willing to share their knowledge and expertise. This is how I explain it to people who ask me, "Isn't it all on the internet?". I take an 8.5 x 11 piece of paper, and tell them this is representative of what is available for records. I put a dot in the center of the paper, surrounded by a box about one inch square. Then I say, "The dot represents what is available online. The square represents what has been microfilmed, and the rest of the paper represents what is available in repositories and on location, in other words what is not available online or on microfilm." It is not meant to represent exact numbers or percentages, but it does offer a visual so that people realize we offer so much more than the internet. If someone has a better visual to suggest, please do.